A look at the main causes of unemployment – including demand deficient, structural, frictional and real wage unemployment. This is unemployment caused by the time people take to move between jobs, e.g. graduates or people changing jobs. There will always be some frictional unemployment in an economy because information isn’t perfect and it takes time to find work. Occupational immobilities. This refers to the difficulties in learning new skills applicable to a new industry, and technological change, e.g. an unemployed farmer may struggle to find work in high tech industries. Geographical immobilities. This refers to the difficulty in moving regions to get a job, e.g. there may be jobs in London, but it could be difficult to find suitable accommodation or schooling for their children. Technological change. If there is the development of labour saving technology in some industries, then there will be a fall in demand for labour. Structural change in the economy. The decline of the coal mines due to a lack of competitiveness meant that many coal miners were unemployed. However, they found it difficult to get jobs in new industries such as computers. This occurs when wages in a competitive labour market are pushed above the equilibrium, e.g. 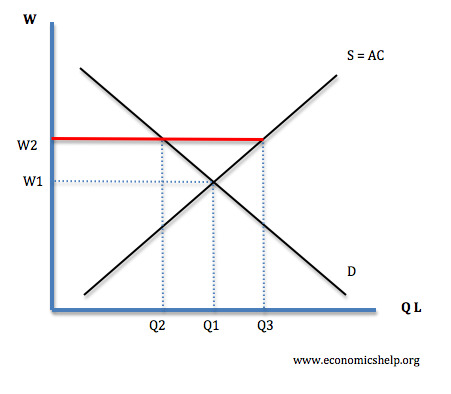 at W2 the supply of labour (Q3) is greater than the demand for labour (Q2). Wages could be pushed above the equilibrium level by minimum wages or trades unions. This is sometimes known as “disequilibrium” unemployment. This occurs when people choose to remain unemployed rather than take jobs available. For example, if benefits are generous, people may prefer to stay on benefits rather than get work. Frictional unemployment is also a type of voluntary unemployment as they are choosing to wait until they find a better job. 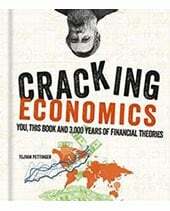 Demand deficient unemployment occurs when the economy is below full capacity. 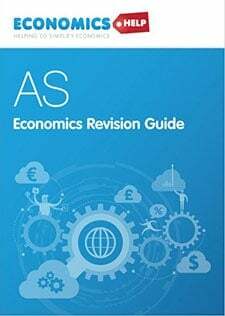 For example, in a recession aggregate demand (AD) will fall leading to a decline in output and negative economic growth. With a fall in output, firms will employ fewer workers because they are producing fewer goods. Also, some firms will go out of business leading to large scale redundancies. In recessions, unemployment tends to rise rapidly as firms lay off workers. 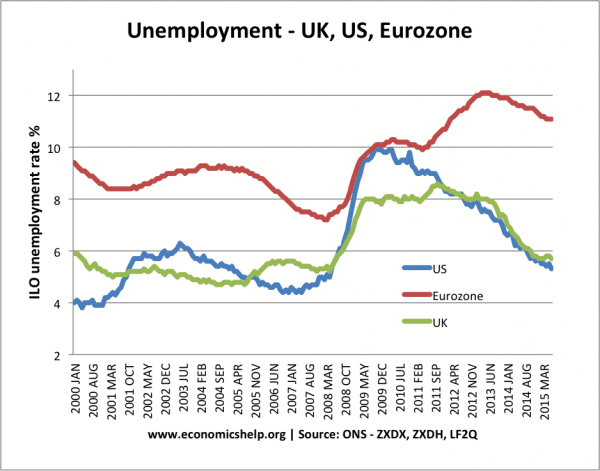 Unemployment in the UK, US and Eurozone rose sharply during the recession of 2008-09. 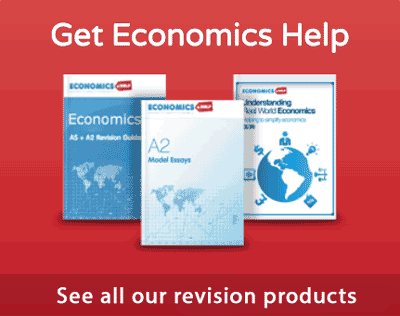 Classical economists emphasise supply side factors as the main cause of unemployment. They argue that demand deficient unemployment tends to be only short term. 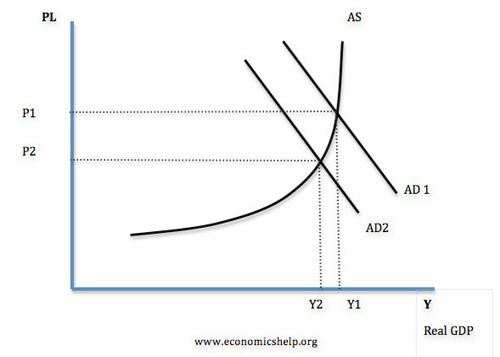 However other Keynesian economists emphasise the importance of aggregate demand in determining unemployment. If wages are cut then there is a fall in consumer spending this causes a fall in AD. Therefore this makes the unemployment situation worse. 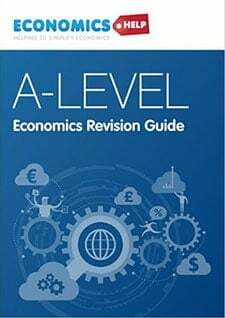 Efficiency Wages Theory. This states that if wages are cut workers become dispirited and work less hard leading to lower output. During recession confidence is low and firms are reluctant to spend money on employing more workers even at a lower wage. 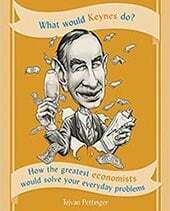 Keynes said in the long run wages may adjust, but in the long run we are all dead! In other words, why wait several years hoping wages will adjust downwards to reduce unemployment. In the 1930s mass Unemployment continued until WW2. However, when governments did begin to spend on military expenditure, unemployment fell. 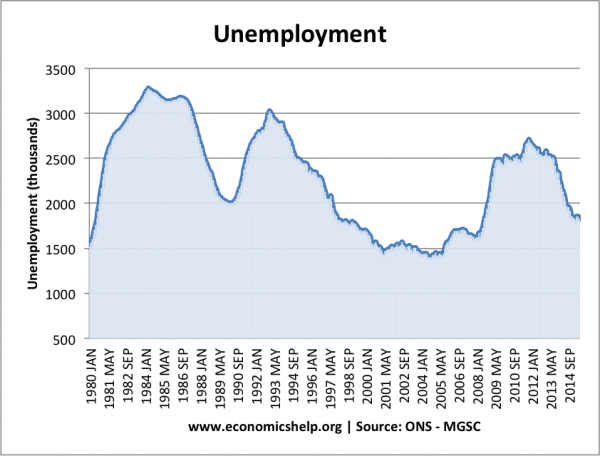 High unemployment in the mid-1980s was also due to structural unemployment. After the closure of coal mines and heavy industries, many former manual labour workers found it hard to gain employment – despite a growing economy. Eurozone growth was sluggish due to Euro debt crisis. The graph also shows higher structural unemployment in the Eurozone. Even during times of growth, the average unemployment rate is higher. This structural unemployment has been attributed to factors, such as labour market immobilities and excessive labour market regulation.